I want to talk about this whole issue of weight loss, and this is going to be somewhat of an unconventional video here. So just play along with me. 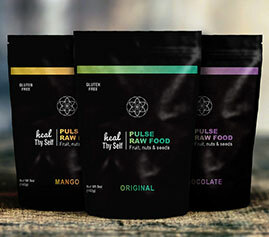 Now, if you’ve seen some of my videos before, you know I talk about the seven principles of health – breathing, drinking the right kind of water, exercise, whole foods, sun, relationships and passion. You’ve probably seen me talking about fasting, and let’s just face it – fasting is the fastest way to lose weight. If you go on a water fast, you’re going to burn about a half a kilo of fat per day and, of course, you’re going to lose a lot more from all the excess toxins and stuff in your colon. But that’s not actually what I want to talk about, because a lot of people will do some fasting, then they start eating again and just put the weight back on. So why do we keep putting all this weight back on? Why can’t you get rid of it? I can tell you – fat is like literally the emotional baggage that we’re holding. The trauma from childhood and parents. The deep held anger and resentment and things that are going on. It’s protection. I want to mention Louise Hay. She has an app where if you look up any type of thing on there, it shows you the mental and emotional connection. When I start to look at specific areas of the body, let’s say fat on the hips, I looked that up and it says lumps of stubborn anger at the parents. I’ve taken people through programs of colon cleansing and deep levels of fasting, and when the fat starts to melt, all of a sudden these emotions are released because they’re trapped in the fats. This is one of the ways that you can clear these deep emotions. That way, when you’re done fasting and have lost the weight, you don’t go back to the same habits and comforts. You don’t have the same emotional need for protection to put that weight right back onto where it started in the first place. Holding fat in the arms is anger at being denied love, so maybe you’re in a current relationship where you don’t truly feel like you’re connecting with your partner, or you’re being denied love. Maybe you feel like you’re being denied love from your mother or father, or your own children. When it comes to the thighs, it says packed childhood anger, so yes, you can lose weight through dietary principles of eating less, but what if you fast and you lose all this weight and you just put it back on? I honestly believe that it’s tied to something very deep inside of us and this is going to require some form of technique that’s really going to help you to identify where this trauma and emotion comes from. You need to identify it, bring it to the surface and completely clear it. 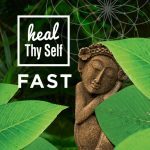 I have a program called the Heal Thyself Fast that’s a nine-day fasting program. You can come to that program and fast and you will drop fat and clean toxins out of the body. But I believe we are going to get to the core and help you clear massive, deep negative experiences that you’ve had in your life. We’re going to share with you what to do going home – what type of lifestyle principles are going to maintain not only your health, but prevent you from putting the weight back on. I honestly believe this is a program that will actually get to the cause of your weight. Not only will it be excess fat you’ve gotten rid of, but all of the trapped trauma and emotion that’s been holding you back from truly expressing yourself and being 100% you that is inside of you that maybe hasn’t been expressed. So I recommend looking into the Heal Thyself Fast. If it’s not for you, maybe start looking into other techniques for healing yourself and looking at these emotional issues and clearing them once and for all. Thanks for watching.